The Nebula and Locus Award–winning fourth novel in the renowned Earthsea series from Ursula K. LeGuin gets a beautiful new repackage. In this fourth novel in the Earthsea series, we rejoin the young priestess the Tenar and powerful wizard Ged. Years before, they had helped each other at a time of darkness and danger. Together, they shared an adventure like no other. Tenar has since embraced the simple pleasures of an ordinary life, while Ged mourns the powers lost to him through no choice of his own. Now the two must join forces again and help another in need—the physically, emotionally scarred child whose own destiny has yet to be revealed…. With millions of copies sold worldwide, Ursula K. Le Guin’s Earthsea Cycle has earned a treasured place on the shelves of fantasy lovers everywhere, alongside the works of such beloved authors as J.R.R. Tolkien and C.S. Lewis. Now the full Earthsea collection—A Wizard of Earthsea, The Tombs of Atuan, The Farthest Shore, Tehanu, Tales from Earthsea, and The Other Wind—is available with a fresh, modern look that will endear it both to loyal fans and new legions of readers. Earthsea is a fictional realm originally created by Ursula K. Le Guin for her short story "The Word of Unbinding," published in 1964. Earthsea became the setting for six books, beginning with A Wizard of Earthsea, and continuing with The Tombs of Atuan, The Farthest Shore, Tehanu, Tales from Earthsea, and The Other Wind. All are set in the world of Earthsea. Each novel in the series has received a prestigious literary award, including the 1969 Boston Globe –Horn Book Award for Fiction and the 1979 Lewis Carroll Shelf Award for A Wizard of Earthsea, the 1972 Newbery Honor for The Tombs of Atuan, the 1973 National Book Award for Children's Books for The Farthest Shore, the 1990 Nebula Award for Best Novel for Tehanu, and the 2002 World Fantasy Award for Best Novel for The Other Wind. Ged, the greatest sorcerer in all Earthsea, was called Sparrowhawk in his reckless youth. Hungry for power and knowledge, Sparrowhawk tampered with long-held secrets and loosed a terrible shadow upon the world. This is the tale of his testing, how he mastered the mighty words of power, tamed an ancient dragon, and crossed death's threshold to restore the balance. Introduce readers to the concept of the Bildungsroman, or coming-of-age story, and examples with which they may be familiar, such as Catcher in the Rye and David Copperfield. Explain characteristics of the Bildungsroman story and ask readers to identify them in the course of reading the novel. Taoist philosophy is represented in all the books of the Earthsea cycle. Have students use print and electronic resources to research the origins of Taoist philosophy, its fundamental characteristics, and influences. 1. How would you describe Ged's personality based on his actions and the descriptions? 2. How would you describe the style in which the story is written? 3. What do you think Ogion means when he says, "[T]o keep dark the mind of the mageborn, that is a dangerous thing"? 4. How would you describe the setting of the story? What kind of world is it? 5. What is the first lesson Ogion wants to teach Ged, and why is it the most important? 6. What does Ged's question about the use of fourfoil reveal about his personality? What point is Ogion trying to make when he asks Ged, "What, after all, is the use of you? or of myself? Is Gont Mountain useful, or the Open Sea?" 7. How would you describe Ogion? What is Ogion's philosophy about magic? What does Ged find surprising about him? 8. What do Ged's actions and decisions further reveal about his personality? 9. What do you think of what the man in the town of Thwil says to Ged, "The wise don't need to ask, the fool asks in vain"? 10. How is the appearance of the School's door appropriate, given that it is a school for wizards? How is it representative of themes expressed in the story and in the lessons Ogion has taught Ged? Why must Ged tell the doorkeeper his true name to gain entrance to the School? 11. Why do you think Lord Nemmerle has Ged read Ogion's letter himself? 12. What is Ged's reaction to what the Master Hand tells him? What do you think the Master Hand mean when he says, "To light a candle is to cast a shadow"? 13. How would you describe Jasper? What are some examples of things Jasper does and says that make Ged angry or envious? 14. Why do you think the otak/hoeg is attracted to Ged? 15. How does Ged try to overcome his anger and envy toward Jasper, and his fear about certain spells of Summoning? 16. What does Jasper say that makes Ged decide to challenge him? 17. What changes does Ged notice when he reads the runes in the Book of Summoning in the darkness? 18. Why do you think Nemmerle sacrifices his life to save Ged? 19. Why is Gensher unwilling to accept Ged's fealty? 20. What is Gensher's explanation for why Ged's spell went wrong? 21. Why does Ged want to be alone? What future does he have in mind for himself? 22. What is the gift Vetch gives to Ged? What is the significance of his act? 23. What do you think the Master Summoner means when he says, "[T]he truth is that as a man's real power grows and his knowledge widens, ever the way he can follow grows narrower: until at last he chooses nothing, but does only and wholly what he must do?" 24. Why do you think Ged must ask the Master Doorkeeper's name to win his freedom from the School—what lesson does this teach? 25. How does Ged feel about his assignment to go to Low Torning? 26. What effect does the world of the dead have upon Ged? 27. How is Ged brought back to consciousness? What effect does this have on his thinking? 28. What does Ged learn from his failure to save Ioeth? 29. What is the significance of Ged's decision to go to Pendor to confront the dragons? 30. How does Yevaud try to manipulate Ged? What does Ged's reaction to Yevaud's offer reveal about his character? What does he learn from his encounter with Yevaud? 31. What signs tell Ged that his shadow is not far from him? 32. Why do you think Le Guin decided to keep Ged from returning to Roke? 33. How would you describe the man who tells Ged to go to the Court of the Terrenon. What does the man say and do that is suspicious? How does the man react to Ged's suspicion? Why does Ged decide to take his advice? 34. What does the gebbeth do to Skiorh? Why does it lead Ged out into the desert before confronting him? 35. Why do you think the gebbeth is unable to catch Ged, even when he tires and can no longer run? 36. Why are Lord Benderesk and Lady Serret so hospitable to Ged? What is odd and suspicious about the Court of the Terrenon? 37. Why is Ged unable to "see things plainly" in the tower-keep? 38. What does Serret reveal about the powers of the Terrenon? 39. Why does Serret not believe Ged when he says he fears the Terrenon? 40. What do you think Serret means when she says: "He who throws away his power is filled sometimes with a far greater power"? 41. Why is the Terrenon unable to capture Ged's will? 42. Why is Ged unable to turn back into his human form? Why do you think he flies to Gont rather than Roke? 43. What does Ogion say that contradicts what Gensher told Ged? How do you think the shadow knew Ged's name? What advice does Ogion give him, and why? 44. Why does Ged want to meet the shadow on the sea rather than on land? 45. Why do you think the shadow turns and flees when Ged pursues it? Why doesn't it attack him when he is lying helpless on the beach? 46. How do the man and woman on the cay react to Ged? Why don’t they want to leave the island? 47. What does Ged's treatment of the man and woman reveal about his character? 48. What is ironic about the way the shadow tricks Ged into crashing into the rocks? 49. What effect does grabbing and holding the shadow have on Ged? What does he realize about his task after this? 50. What strange thing happens to Ged on Vemish? What explanation do you have for this phenomenon? 51. Why does Ged at first refuse to let Estarriol accompany him, and how does Estarriol persuade Ged to let him come? Why is it appropriate that Estarriol should be there? 52. What happened to Jasper? Why do you think he left Roke? 53. What possible future does Ged see that frightens him? 54. What explanations do Ged and Estarriol have for the strange behavior of the shadow—for its taking Ged’s form and its inability to defeat Ged by speaking his name? 55. According to Ged, what is the fundamental difference between summoning light and summoning an object? Why is it that summoning light does not upset Equilibrium, yet summoning an object does? 56. Why do Ged and Estarriol avoid using magic on this final voyage? 57. What brief vision does Ged have about where he will meet the shadow? 58. What fears does Estarriol have about their voyage? 59. What is your interpretation of the way in which Ged defeats the shadow? 60. How would you describe the place where Ged meets the shadow? How does it come into existence, and why does it suddenly disappear? 61. Were you surprised by what happens when Ged confronts the shadow? Would you say that his realization is true of all human experience? 62. What is the meaning of the lines quoted from the Creation of Éa: "Only in silence the word, only in dark the light, only in dying life: bright the hawk's flight on the dying sky"? How do these lines relate to the story? 1. Identify three examples of foreshadowing in the story. 2. Create profiles of the major characters in the novel: Sparrowhawk/Ged, Ogion, Vetch/Estarriol, Jasper, Ged’s shadow, and Lady Serret. What facts about each one are important to the story? 3. What are the main themes and messages of the story? Discuss how the characters, setting, and plot help develop these themes. 4. What aspect(s) of the story do you like best? Discuss why you find them appealing. Why is this world called Earthsea? How would you describe it? Why do you think LeGuin chose to set her story in such a world? 5. The language of A Wizard of Earthsea is often poetic. Comment on three sentences that you find particularly beautiful or moving. In what ways is a writer or artist like a wizard? 6. Compare the evil of the shadow with the evil of Terrenon. Are they evil in the same way? How do they differ? In this second novel in the Earthsea series, Tenar is chosen as high priestess to the ancient and nameless Powers of the Earth, and everything is taken from her—home, family, possessions, even her name. She is now known only as Arha, the Eaten One, and guards the shadowy, labyrinthine Tombs of Atuan. Then a wizard, Ged Sparrowhawk, comes to steal the Tombs’ greatest hidden treasure, the Ring of Erreth-Akbe. Tenar’s duty is to protect the Ring, but Ged possesses the light of magic and tales of a world that Tenar has never known. Will Tenar risk everything to escape from the darkness that has become her domain? 1. What do the priestesses mean when they say of Tenar: "Let her be eaten!"? 2. What does it mean when the girl is transformed from Tenar to the Eaten One? 3. How was Arha chosen? 4. How would you describe Arha's life in the Place of the Tombs of Atuan? 5. What is Penthe's relationship with Arha? 6. Why does Arha continue to be frustrated even after crossing into womanhood? 7. How does Manan show Arha new ways of seeing? 8. Why does Kossil fear the tombs? 9. Who are the prisoners in the tombs? For what reasons are they imprisoned? 10. What does Kossil say Arha will learn? 11. What does Arha find herself in agreement about with Penthe? What is it about Penthe's words that frighten Arha? 12. Why does Arha return to the cavern day after day? 13. What does Thar tell Arha about the labyrinth? 14. What is the Ring of Erreth-Akbe? 15. What is Kossil's view of the Wizards of the West? 16. How does Arha feel about Kossil's "unfaith"? 17. Why is Arha conflicted over how to deal with the intruder? 18. What is Sparrowhawk's purpose in coming to the Tombs of Atuan? 19. What does Arha mean when she says: "You know everything, wizard. But I know one thing—the one true thing!" What is the “one true thing”? 20. Why does Arha let Sparrowhawk live? 21. Why does Arha bring Sparrowhawk to the Undertomb? 22. What is the significance of Arha's dream of the birds? 23. When Arha says: "The gods are dead, the gods are dead," what is Sparrowhawk's response? 24. Why can't Sparrowhawk tell Tenar how he found her name? 25. How does Tenar's decision to go with Sparrowhawk set them both free? 26. What does Ged tell Tenar when she says: "The evil must be paid for. I am not free"? 27. The wizard, Ged, explains to Tenar that the Nameless Ones are the Tombs of Atuan, and cannot leave the Place. Why does Le Guin limit the dwellings of the dark powers to a single location in her fantasy world? 28. Le Guin emphasizes the Equilibrium of dark and light forces throughout the Earthsea Cycle. Does Le Guin justify Ged's argument that the dark powers should not be "denied or forgotten?" Why must they be equal with the light powers? How do the sentences that describe the small evils that exist in the world add to this argument? 29. Why does Le Guin make her dark forces nameless in a world where magic and power revolve around names? 30. Why do you think Le Guin describes the dark powers as "holy Powers"? In this third book in the Earthsea series, darkness threatens to overtake Earthsea: the world and its wizards are losing their magic. But Ged Sparrowhawk—Archmage, wizard, and dragonlord—is determined to discover the source of this devastating loss. Aided by Enlad’s young prince, Arren, Ged embarks on a treacherous journey that will test their strength and will. To restore magic, the two warriors must venture to the farthest reaches of their world—and even beyond the realm of death. 1. Sparrowhawk says to Arren: "When I was young, I had to choose between the life of being and the life of doing. And I leapt at the latter like a trout to a fly. But each deed you do, each act, binds you to itself and to its consequences, and makes you act again and yet again. Then very seldom do you come upon a space, a time like this, between act and act, when you may stop and simply be. Or wonder who, after all, you are." What prompts Sparrowhawk to share this with Arren? Why does Arren find it so surprising? 2. Who is the only creature capable of upsetting the great Balance and what is the cause? 3. Why do you think Le Guin italicizes the sentence, "Infinite are the arguments of mages . . . . "? What might she be trying to create or set up with this statement? 4. When Arren asks if dragons do great evil, Sparrowhawk replies, "Who am I, to judge the acts of dragons? . . . They are wiser than men are. It is with them as with dreams, Arren. We men dream dreams, we work magic, we do good, we do evil. The dragons do not dream. They are dreams. They do not work magic: it is their substance, their being. They do not do; they are". What do you think Sparrowhawk means when he says dragons are dreams? What is it that makes dragons wiser than men? How is this view of dragons different from how they are depicted in J. R. R. Tolkien's The Hobbit or other fantasy stories? 5. What do Arren and Sparrowhawk find to be wrong with Hort Town? 6. What do you think Sparrowhawk means when he says of Hare, "For all his craft in sorcery, he has never seen the way before him, seeing only himself"? 7. Why does Arren look upon Sparrowhawk "with love, but also with fear"? What is the great gift of childhood? 8. What had Arren hoped was the reason for Sparrowhawk choosing him for the voyage? 9. What do you think Le Guin means when she writes: "To be one's self is a rare thing and a great one"? How does the idea of being one's self play out in the rest of the novel? 10. Why would Sparrowhawk consider immortality evil? Why is death a necessity? 11. What do Arren and Ged find on the Dry Land? How does Arren feel about what he sees? 12. Who is Cob and why does he refuse Ged's offer to give him death? 13. What is revealed in The Deed of Ged? Years before, Tenar and Ged had escaped together from the sinister Tombs of Atuan—she, an isolated young priestess, and he, a powerful wizard. Now she is a farmer's widow, having chosen for herself the simple pleasures of an ordinary life. And he is a broken old man, mourning the powers lost to him not by choice. A lifetime ago, they helped each other at a time of darkness and danger. Now they must join forces again, to help another—the physically and emotionally scarred child whose own destiny remains to be revealed. 1. What has become of Tenar since leaving the Tombs of Atuan? 2. Why does Ogion send for Goha? 3. What do you think Goha means when she says she doesn't know what a wizard is but does know what one does? 4. What does Goha tell Therru about Ogion? 5. What are the disturbing rumors heard about the art of magic? 6. What does Ogion say has happened to Ged? 7. What does Ogion say about Therru? 8. Who will Ogion be known as in death? 9. How has Therru changed since coming with Tenar to Ogion's? 10. Why does Tenar wonder if fear is the bond she has with Therru? 11. Who does Tenar encounter on Gont Mountain? 12. What is the gebbeth? 13. What is Aunty Moss's reply to Tenar's question about what is wrong with men? 14. Who has Arren become? 15. What is significant about Therru staring at Ged? 16. What keeps Tenar from leaving Ogion's house? 17. What promise does Tenar make to Ged? 18. Why does Tenar resist Beech's suggestion about Therru? 19. What is Tenar's response to Ged's remark that no woman can be archmage? 20. What do you think will become of Ged, Tenar, and Therru? The tales of this book, as Ursula K. Le Guin writes in her foreword, explore or extend the world established by her first four Earthsea novels. Yet each tale stands on its own. "The Finder," a novella set a few hundred years before A Wizard of Earthsea, presents a dark and troubled Archipelago and reveals how the school on Roke came to be. "The Bones of the Earth" features the wizards who taught the wizard who first taught Ged, and it demonstrates how humility, if great enough, can rein in an earthquake. "Darkrose and Diamond" is a delightful story of young courtship showing that sometimes wizards can pursue alternative careers. "On the High Marsh," from the brief but eventful time of Ged as Archmage of Earthsea, tells of the love of power—and of the power of love. "Dragonfly" shows how a woman, determined enough, can break the glass ceiling of male magedom. Taking place shortly after the last Earthsea novel, it also provides a bridge—a dragon bridge—to the next Earthsea novel, The Other Wind. The author concludes this collection with an essay about Earthsea's history, people, languages, literature, and magic, and provides two new maps of Earthsea. 1. "The Finder," is a novella that tells the story of Otter/Medra and the origins of the school of magic upon the "Isle of the Wise," the island of Roke. The story is set about three centuries before the time of Ged. "The Finder" tells of a dark and deeply troubled Archipelago and a time when magic and the wielders of magic were feared and mistrusted. How is this story important to understanding the history and mythology of Earthsea? 2. "The Bones of the Earth" is set on the island of Gont where Ged was born. The story centers on an old, stubborn wizard named Dulse and his apprentice, the mage Ogion, who will become Ged's first teacher in sorcery. How does this story depict a wizard's life? How does the story serve to further illuminate Ogion's character? 3. In what way does the romantic tale, "Darkrose and Diamond," show that wizards can choose to follow an alternative path to becoming one of the "people of power"? 4. In what way does "On the High Marsh" contrast the love of power and the power of love? How does this story explore the theme of redemption? 5. How does "Dragonfly" function as a link between the novels Tehanu and The Other Wind? In what way does the story show that even the greatest of the ruling mages of Earthsea is fallible and prone to errors of judgment? 6. In what ways are the stories and essays in this collection a reinterpretation of the world of Earthsea as it was depicted in the first four novels? The sorcerer Alder fears sleep. He dreams of the land of death, of his wife who died young and longs to return to him so much that she kissed him across the low stone wall that separates our world from the Dry Land—where the grass is withered, the stars never move, and lovers pass without knowing each other. The dead are pulling Alder to them at night. Through him they may free themselves and invade Earthsea. Alder seeks advice from Ged, once Archmage. Ged tells him to go to Tenar, Tehanu, and the young king at Havnor. They are joined by amber-eyed Irian, a fierce dragon able to assume the shape of a woman. The threat can be confronted only in the Immanent Grove on Roke, the holiest place in the world, and there the king, hero, sage, wizard, and dragon make a last stand. 1. Why did the Lord Patterner send Alder to Sparrowhawk? 2. What is Alder's training and abilities in magic? 3. What demands are the dragons making of King Lebannen? 4. What are the emissaries of the High King of the Kargs asking of King Lebannen? 5. Why does Tehanu agree to accompany the King on a mission to parley with the dragons? 6. What is at the root of the unbalancing of Earthsea? 7. What does Tenar mean when she says Tehanu is "the child of many and none"? 8. How is Tehanu freed from the burden of her childhood injury? 9. How is the spell that created the Dry Land broken? 10. In what ways is a new world order born in Earthsea? 11. How would you describe the roles of Sparrowhawk and Tenar in this story? 12. 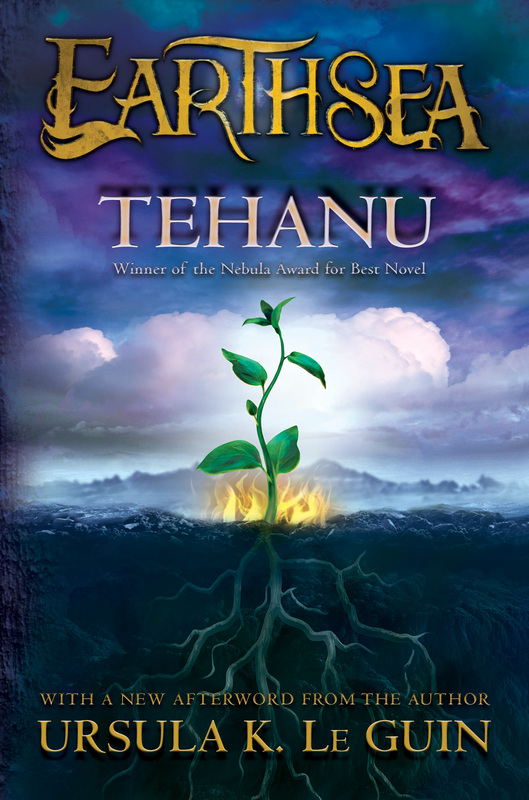 What do you think will become of Tehanu? 13. Identify examples of how the theme of reconciliation is addressed in this story. Bernardo, Susan M. and Graham J. Murphy. Ursula K. Le Guin: A Critical Companion. Westport, CT: Greenwood Press, 2006. Cadden, Mike. Ursula K. Le Guin Beyond Genre: Fiction for Children and Adults. New York, NY: Routledge, 2005. This guide was written by Edward T. Sullivan, a librarian and writer. 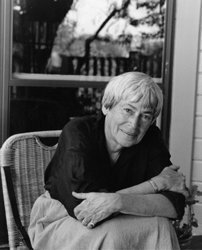 Ursula K. Le Guin (1929-2018) has published twenty-one novels, eleven volumes of short stories, four collections of essays, twelve books for children, six volumes of poetry, and four of translation, and has received the Hugo, Nebula, Endeavor, Locus, Tiptree, Sturgeon, PEN-Malamud, and National Book Award and the Pushcart and Janet Heidinger Kafka prizes, among others. In recent years she has received lifetime achievement awards from World Fantasy Awards, Los Angeles Times, Pacific Northwest Booksellers Association, and Willamette Writers, as well as the Science Fiction and Fantasy Writers of America Grand Master Award and the Library of Congress Living Legends award. Le Guin was the recipient of the Association for Library Service to Children’s May Hill Arbuthnot Honor Lecture Award and the Margaret Edwards Award. Her recent publications include the novel Lavinia, Words Are My Matter, an essay collection, and Finding My Elegy, New and Selected Poems. Her website is UrsulaKLeGuin.com. "New and longtime Earthsea fans will be drawn to these impressive new editions."